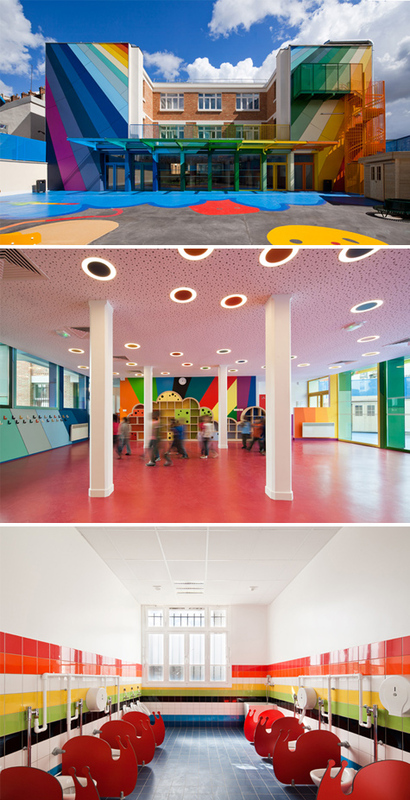 Designed by Palatre & Leclère, Ecole Maternelle Pajol is a four-classroom kindergarten in Paris that takes great advantage of the color spectrum as their primary design element. I am equally delighted and disappointed by this project. That bathroom truly won my heart! 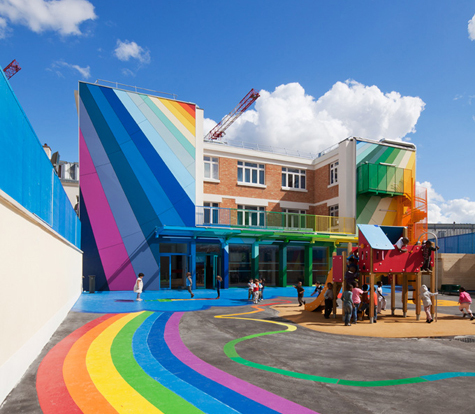 But does the rainbow scheme serve any wayfinding purpose (eg. the blue room, the red door, et cetera), or is it borderline overwhelming for the children? And why a hardscape playground? Surely the architects could have integrated graphic applications with natural textures that would cool the space in the summer, absorb water runoff, and serve as learning spaces. Awesome - you're back!! You're on my daily list of things to read and I thought you were never coming back. A sweet thing to say! I'm never fully gone, I just have to balance fun (blog) with finding a job, etc., so the schedule fills up.